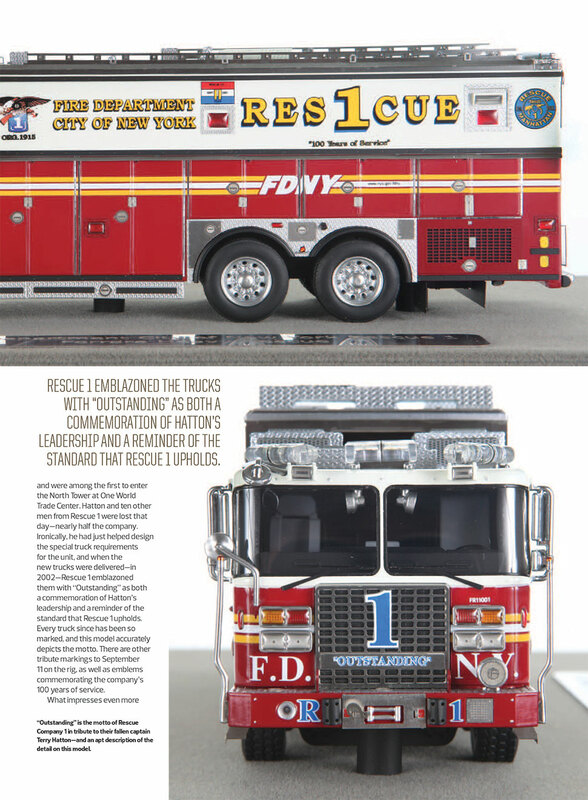 The first museum grade FDNY Rescue 1...featuring over 600 hand-crafted parts. 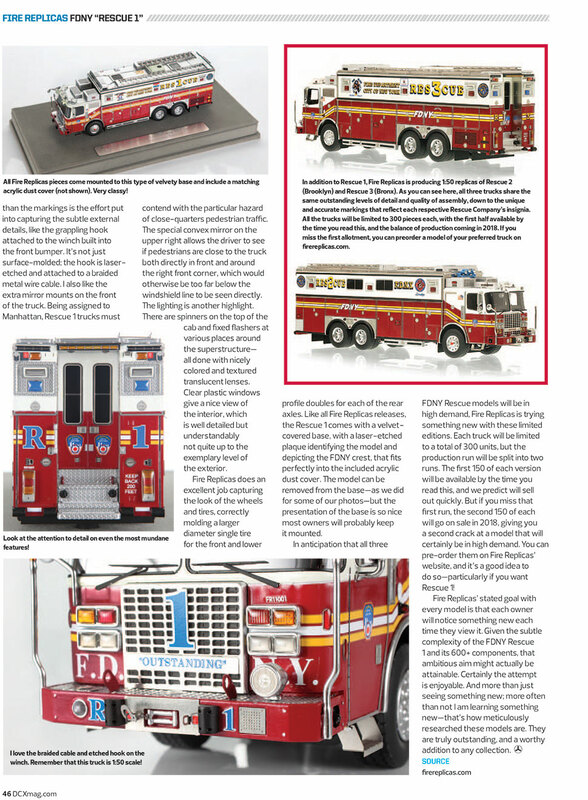 From the design to the graphics, this 1:50 scale replica emulates the real Ferrara Heavy Rescue. Our goal with each release is that our customers may notice something new each time they view the model. Impeccable detailing and true-to-scale parts that only stainless steel can provide. 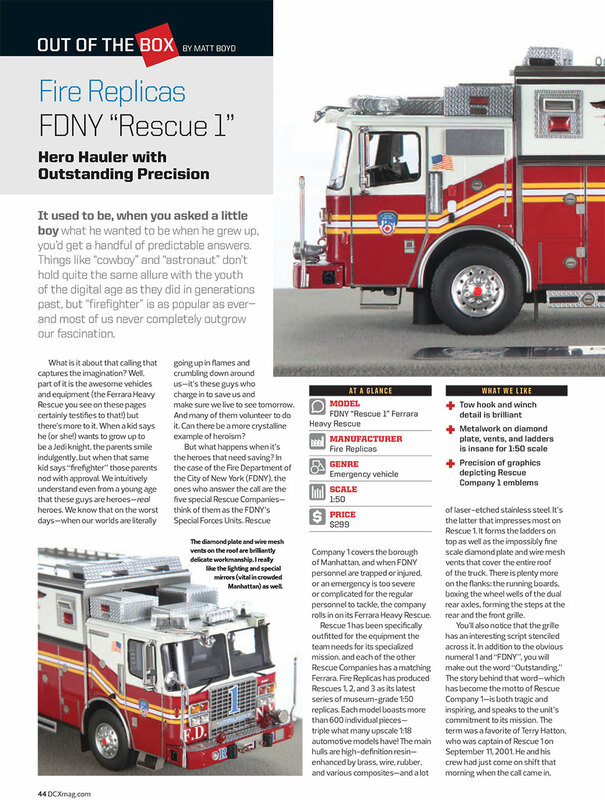 FDNY Rescue 1 ushers in a new standard in 1:50 scale modeling that is sure to impress the most discriminating collectors. Limited in production for Outstanding value. A maximum of 300 units of Rescue 1 will be produced. Fire Replicas are designed with the elite collector in mind, and manufactured in limited quantities to enhance future value. The FDNY Rescue 1 measures 9"L x 2.5"W x 3"T and is securely displayed inside a custom case. The case dimensions are 12"L x 6"W x 5.25"T and the platform includes an etched stainless steel nameplate with the FDNY seal, department and truck name. This FDNY Rescue 1 scale model is a museum grade replica. Like all Fire Replicas models, every detail is modeled to perfection and with razor sharp precision. The replica features the specific department configuration and graphics, leaving no detail overlooked. The display case is custom manufactured with high quality acrylic and resin. The stainless steel etched plate features the department and truck name, and department seal. This replica is a treasure to be displayed and admired and is in no way a toy. The model itself is incredible. Amazing details and love the design 5 stars! Also nice touch with the hand written card! Shows you guys care about your work! Where to start?Amazing piece. This is my first truck from Fire Replicas. You get a hand written message from the president/ceo of the company thanking you for your purchase. Back to the truck no detail is left out. From the computer in the officers seat in the cab of the truck, to the Big 1 on the grill with "outstanding". All around amazing truck. Super happy I ordered one before they sell out. Pictures don’t do this model justice! The quality and accuracy is absolutely stunning, I will be purchasing more models in the future for sure!! To call this model perfect & stunning is an understatement, what an excellent model this is, with all of Fire Replicas usual great eye for detail.